Historically, Pet Sounds has never been taken quite as seriously as the other biog albums from 1966, Bob Dylan’s Blonde On Blonde or The Beatles’ Revolver. Perhaps this is down to the fact that The Beach Boys lacked the countercultural edge of Bob Dylan and The Beatles, or maybe it had something to do with its literal, artless front cover. But that was then. Today, Pet Sounds is regarded not only as the equal of those records but, in some quarters, their superior. Certainly, together with the equally groundbreaking single Good Vibrations, which followed it five months later, it drew up an ambitious road map for rock’s future. It may have been a quantum leap for its composer, fragile ‘man child’ Brian Wilson, but Pet Sounds wasn’t quite a bolt from the blue. Close scrutiny of the band’s catalogue will reveal intimations of the album’s lush, solipsist sorrow as far back as The Lonely Sea, from their 1963 second album Surfin’ USA, or early ballads such as The Warmth Of The Sun and In My Room, while 1965’s Today! featured a suite of songs on side two that evinced a harmonic sophistication and a desire to explore more mature themes than the usual surfing and hot rods. Pet Sounds, though, was a sustained act of complex creation, one part work of orchestral ambition, one part proto-concept album. A nervous breakdown on a flight between LA and Houston in December 1964 had prompted Brian Wilson to refocus his energies from touring and promotion to the more enjoyable pursuits of songwriting and the boundless potential of the recording studio. He had been further liberated by his introduction to marijuana and hallucinogenics the following year. Now, with The Beatles’ Rubber Soul ringing in his ears and his competitive streak risen, he set out to make what he promised his wife Marilyn would be “the greatest rock album ever made”. To turn the pocket symphonies in his head into gorgeous reality, he made two crucial moves. Firstly, he entrusted the task of translating his ideas about the loss of innocence and the imponderability of existence to advertising copywriter-turned-lyricist Tony Asher. Secondly, he enlisted the help of ace session musicians The Wrecking Crew, including guitarist Glen Campbell and bassist Carol Kaye, veterans of Phil Spector’s Wall Of Sound, with the 23-year-old Wilson orchestrating the sessions himself. The resultant songs – Wouldn’t It Be Nice, Don’t Talk (Put Your Head On My Shoulder), I’m Waiting For The Day, God Only Knows, I Just Wasn’t Made For These Times, Caroline, No – were perfect miniatures of hymnal wonder, which expressed with devotional clarity the anxieties and longings of an adolescent poised on the cusp of agonising maturity. If the role of the rest of The Beach Boys was diminished on a musical level, Pet Sounds was still a triumph of vocal layering. It certainly wouldn’t have been possible without the input of Wilson’s brothers Dennis and Carl, cousin Mike Love, Al Jardine and new member Bruce Johnston. 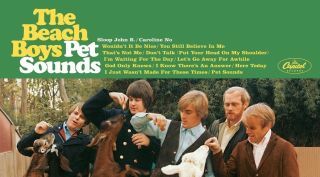 In 2012, Mike Love suggested Pet Sounds was the work of a man “at the top of his game… as avant garde as pop has ever got”, blowing his popular image as the villain of the Beach Boys story out of the water. But Wilson wasn’t done. Pet Sounds may have stalled at No.10 in the US after its release in May 1966, but any disappointment at its commercial performance was allayed by the arrival of a new single, Good Vibrations, in October. With its modal shifts and multi-sectional mosaic of sound fragments pieced together by Wilson over eight months in multiple studios, it set new standards with regard to what rock music could sound like and do, and blazed a trail for others to follow. It was the epic, euphoric anthesis of Pet Sounds’s glorious melancholia.